Living in a dull house? You can’t always update the house itself, but you can make a few simple changes to brighten up different spaces without breaking the bank. House plants are a cheap, attractive way to make any room look larger, airier, and brighter. The best part is that if you make the right plant choices, they’re also low-maintenance. You don’t need to bring a lot of colored, flowering plants to make your home feel brighter and friendlier. The right types of plants can improve your home without you having to wait for the right season for them to bloom. Look for plants with beautiful leaf patterns and vibrant colors, like bamboo small cactuses or succulents, and dwarf palm trees. Some of the plants that do well indoors also have patterns on their leaves or stems, like the snake plant. Choose Long-Lasting Flowers If you’re going for a smore colorful indoor display, choose plants that have a long flowering cycle. Many flowers come and go quickly during the spring, but you can find specific plants and types of plants that hold onto their flowers for months at a time. The most notable plant with a long-lasting flower is the orchid. It’s available in a lot of different colors, and it’s simple to care for in your home. 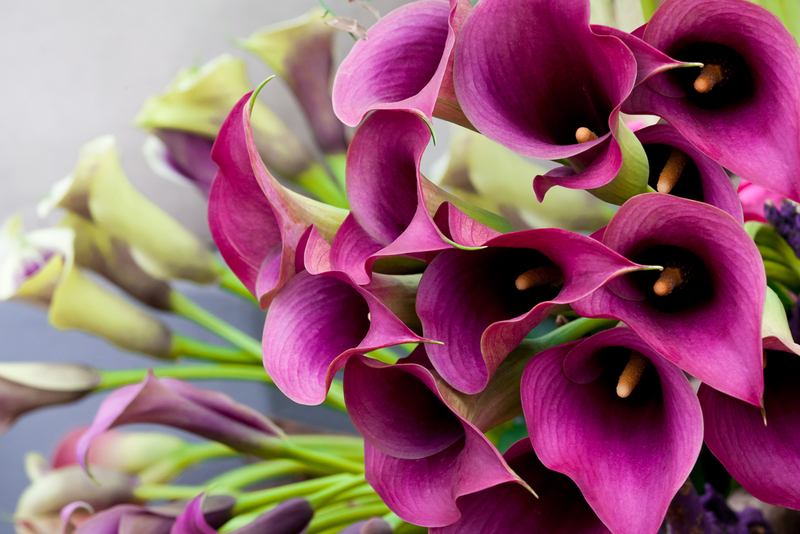 You can get different varieties of lilies, like the peace lily or calla lily. Small hydrangea shrubs also do well indoors and can bloom in a wide range of colors. The pot and planter you put your flowers and house plants in will add color to the room. Find a setup that complements that plant inside it. This way you’ll emphasize the beautiful colors of the blooms and help the striking green leaves stand out. The pot or planter can also be used to match the décor inside your home, to help tie everything together. Many herbs are small and beautiful, and can be grown inside on a window sill. Once they have matured a bit, you can use them in your homemade meals! 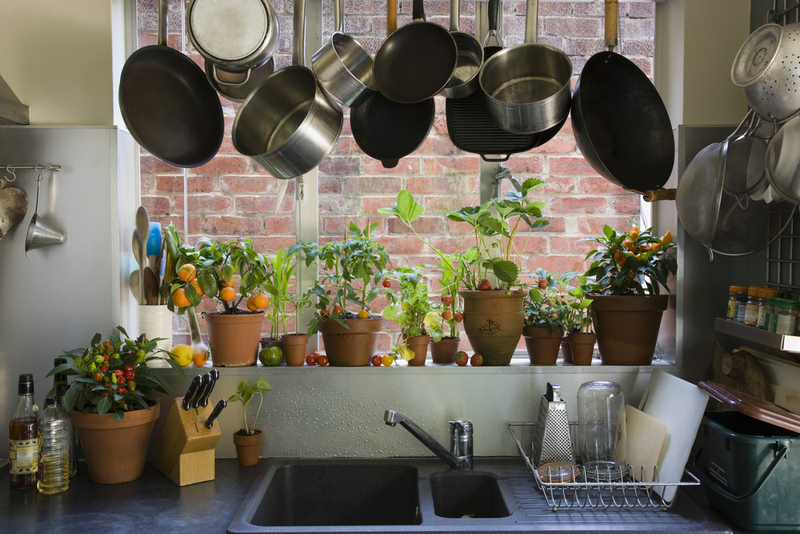 Depending on what you actually want, you can customize your little kitchen garden. Mint, rosemary, parsley, basil, cilantro, thyme, lemongrass, oregano, and sage all do well on a windowsill. Lemon balm and chives are more colorful additions to your home herb garden. For veggies, you may need to give them a little time outside if you want some of them to thrive, but they can be grown mostly indoors. Try carrots, garlic, small fruit trees like avocados or mandarin oranges, salad greens, and spinach. Tons of colorful plants don’t need much natural light to thrive. Some actually prefer dim spaces to bright sunlight, making them a perfect option for dark rooms. Plants like the orchid, areca palm, snake plant, and peace lily all do well in indirect, low light. Don’t focus on just the inside of your home. 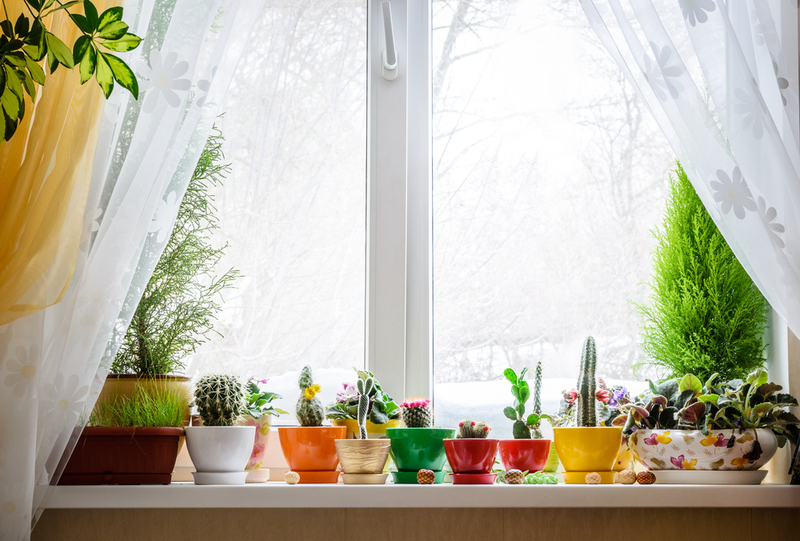 Hanging pots of flowers can be seen through your windows and make your home’s outside (porches, decks, etc.) more beautiful. Imagine sitting out on the deck, surrounded by beautiful blooming flowers in the spring and summer! Choose the right hanging pots, and you can spread the natural beauty of your houseplants outside as well. You don’t always need home renovations or expense re-decorating to make your home a bit brighter and more comfortable. The right choice of plants can add a new life to any room. Plus, you won’t have to do much to take care of them!